We've talked a lot about becoming more efficient on this show and today we are actually going to do a complete 180 degree turn and talk about being less efficient........and more human. Do you ever feel like we are evolving towards a point where we will just be sitting on a couch all day and virtual reality, Google, and robots will be taking care of all the hard parts of life? Well today my friend Brock Armstrong is going to throw a wrench in this process and encourage us to put down the remote control and start expressing our humanity. 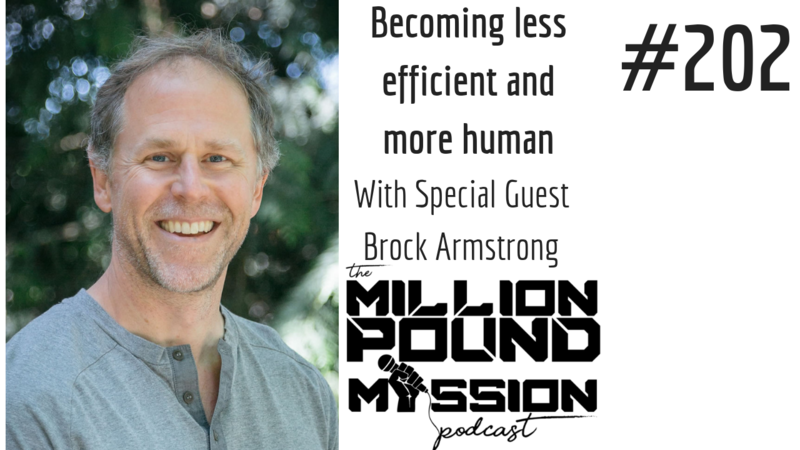 Brock is the host of the Get Fit Guy podcast and a fitness coach with a huge passion for learning about health and wellness and then teaching others how to apply his knowledge to their own health game plan. The story of his own health journey. His tips so that we can become better implementors. How he feels about biohacking and what "hacks" he has been adding to his own health routine. His philosophy of micro dieting. His best tip for someone that feels like they want to get healthy but they aren't quite sure where to start. Ready to break the cycle of losing weight and gaining it back.....over and over again? Check out my Transformation ReBoot program and enter the promo code FIFTY to save 50% off of your launch price! It's time to escape the Black Hole of Fitness DOOM!